Android Ice Cream Sandwich is a marvel of advanced engineering: a powerful, handsome, and versatile operating system that presents a universe of opportunities--if you know how to use it. But most of us could use some help on that score. 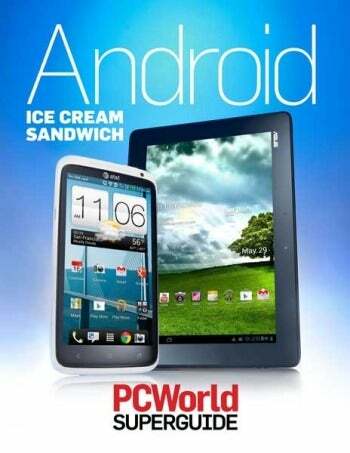 Fortunately, assistance is now available in the form of PCWorld’s just-published Superguide, an in-depth look at Android Ice Cream Sandwich for smartphone and tablet owners. The all-new guide, written by PCWorld’s mobile experts, can get you started on Ice Cream Sandwich in a hurry, with a walk-through of new features, a generous collection of tips and tricks, and a guide to essential apps for both phones and tablets. Want to defend your phone against obnoxious ads? Or back up your phone? Or upload 20,000 of your own songs to the cloud and then stream them back to your Ice Cream Sandwich device for free? This authoritative volume offers step-by-step instructions for everything you need to know to accomplish these tasks and many more. Other sections evaluate the best browsers, security apps, and utilities for your phone, and even show you how to transform your smartphone into a high-end camera. For Ice Cream Sandwich tablet users, we explain how to use Android Widgets, and we rate the best news, weather, reference, and communication apps. If you’d like to read the book on your PC, consider opting for a complete 97-page full color PDF in a convenient 10MB download for $12.99. Or cover all your bases by getting a copy of our Superguide in versions suitable for all of your devices (.ePUB, .PDF, and .MOBI file formats) with our $14.99 ebook and PDF bundle. If you don't want to download the bundle, you can instead have it sent to you on CD-ROM for only $14.99 including shipping and handling. You can also read our Android Ice Cream Superguide right away on an iOS device by purchasing it from Apple’s iBookstore for $12.99. If you prefer reading on a Kindle or a Nook, you can find the book at the Kindle Store or the Nook Bookstore for the same price. Want to try the book before purchasing anything? You can download a preview from our website. Be sure to check out our other available Superguides, including our Speed Up Everything Superguide, our Windows 7 Superguide, and our Android Honeycomb Superguide. Buy now: The Android Ice Cream Sandwich Superguide is available as a downloadable PDF, at the iBookstore, or via Kindle or Nook for $12.99; or in a downloadable ebook bundle (containing .ePUB, .PDF, and .MOBI file versions) or as an ebook bundle CD-ROM for $14.99.